This disc was auctined on eBay in November 2004. It features a very unusual handwriting which I have no info about. It is assumed that it is the standard mono mixes. 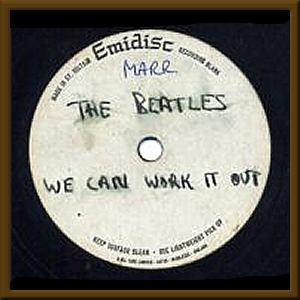 A very rare Beatles Emidisc acetate with the hand-written titles "WE CAN WORK IT OUT" and "DAY TRIPPER"
Condition - Fair - The record is still just playable but has not been cared for properly and displays considerable surface noise, There are no loud scratches but lots of minor ones, it didn't jump tracks. There is no cover just a clear plastic sleeve. This item was part of an auction lot bought about 20 years ago. Every single in the lot was a factory demo, emidisc or promo sample. 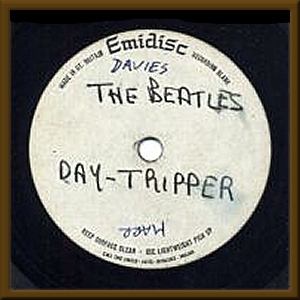 Each record had the names of either "MARR" or "DAVIES" (or both) hand written on the label.